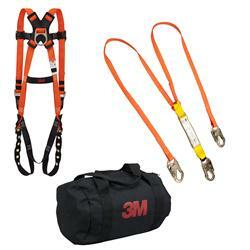 This kit allows for use on aerial lifts allows for 100% tie-off. It contains the 3M Feather Harness 1050 (Universal size), the 3M SafeAbsorb 6 ft. Dual Leg Energy Absorbing Lanyard with Snap Hooks 3550 and the 3M Tool Bag 4514 for storage. Jaco Aerospace and Industrial is your one stop resource for 3M(TM) 100% Tie-Off Kit 30550, 1 ea/case and all of your 3M Products, Tapes, aerospace and industrial needs. SKU Marketplace Product Description: This kit allows for use on aerial lifts allows for 100% tie-off. It contains the 3M Feather Harness 1050 (Universal size), the 3M SafeAbsorb 6 ft. Dual Leg Energy Absorbing Lanyard with Snap Hooks 3550 and the 3M Tool Bag 4514 for storage.